Creating and accessing your Pipe Reports is as simple as it seems. All you need to do is access the Pipe you want to generate a report from and open the ‘Reports’ tab on your Pipe dashboard's header. This is what your ‘Reports’-dashboard looks like. If you already have a saved report and want to access it, just click on its title. If you’d like to create a new report, click the ‘Create new report’-button. This is the first screen you see after clicking the ‘Create new report’-button. 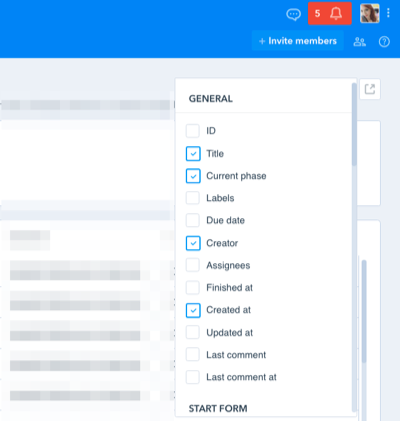 The standard columns shown on all new reports are ‘Title’, ‘Current phase’, ‘Creator’ and ‘Created at.' The records are related to the Cards on your Pipe. 1. Formula - The formula function works for ‘Number’-type fields. As soon as you enable ‘Formula,' a field will appear where you can choose to display the Sum, Average, Minimum value or Maximum value. 2. Field select - You can customize the information you want to see on your report by clicking the second button. When you select it, it will open a dropdown menu with all Phases and Fields you have on your Pipe. Check the boxes with the Field of origin of the information you want to see. 3. Export - As soon as you click ‘Export’, your report will be converted in XSLX format, and a download link will be sent to your registered email. From here, you can extract your data and work with it within other software. Let’s set up your report! As a first, think carefully of what you would like to see on your Pipe Report when creating fields. The reports can only display the information you've added to your fields so keep that in mind when structuring your pipe. Then, select the Fields you want to see via the 'Columns'-button (2). You’re able to drag and drop the columns to change the order in which they appear. You can also click on the column's name to organize the information (for example: clicking on ‘Label’ will let you see your report’s information ordered and grouped by labels. The same goes for creator, assignees, etc.). In my report, I would like to evaluate how my sales agents are performing in terms of Deal Value. 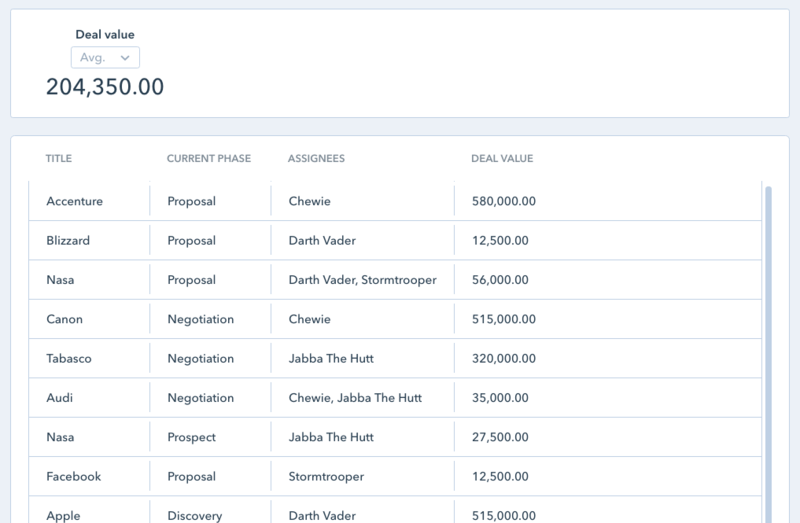 You can see that my average the team's deal value is $204,350.00 and that Chewie currently closed the biggest deal. Now, let’s assume we have a very big Pipe with a lot of Cards and several different sales reps. You want to see only the deals Chewie has closed. In this case, move to the left side of your Reports dashboard – ‘Filtering’. Here, you can set filters so only the information that matches your criteria will be displayed in your report. In my Sales Pipeline, it can also be useful to track my rep’ performance over fixed periods of time, say, months. In that case, you can filter deals won during this month by simply selecting 'first time entered Won' is 'current month'. Here, you can choose to filter based on period, relative or absolute values. Period means you set a specific period, which can be today, yesterday, last month or maybe this week. Relative values ask you to indicate if you want to see [more than/is/less than] [X days/hours] [ago/ahead]. Absolute values ask you to indicate [more than/is/less than/is unknown/has any value] of a specific date. Once you’re satisfied with the layout of your report, you can save it. 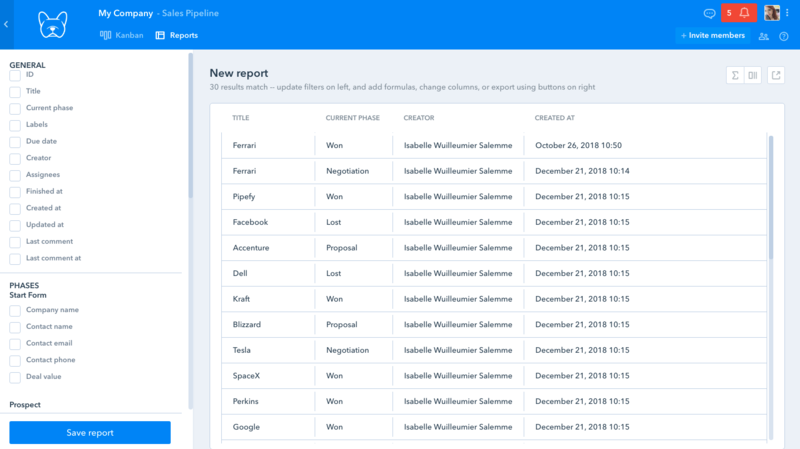 By saving a report, you're basically creating a template for the report, with all columns already set in place. The report will be updated whenever more cards fit the established criteria/filters. The possibility to save your reports is especially useful if you want to measure different things within one single Pipe. You can find the blue ‘Save report’-button on the lower left corner of your screen. How to edit Pipe Reports?